Probably my favourite virtual reality experience was unearthed around 1863 in the Roman suburb of Prima Porta. Well, it’s not a virtual reality experience as much as it’s an illusionistic fresco on four walls, but bear with me. In the villa of Livia Drusilla (58 BCE-29 CE), the wife of the first emperor of Rome, there is a chilly, underground room designed as a simulatory visual experience. It’s a lush garden. Firs, turkey oaks, palm, myrtles and pomegranate trees, some exotic to Rome, dot the landscape, all in stunning perspective. To the Romans, the painting was reportedly transportative. Everywhere you look, the garden appears to bend to your point of view and re-form around you. The walls are windowless, contributing to the caprice. 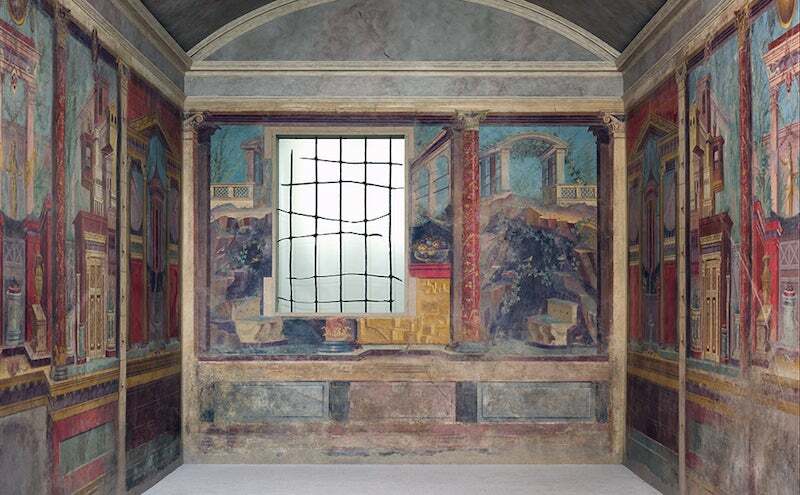 In 25 BCE, when Livia’s Garden Room was designed, the fresco was a cutting-edge, immersive technology. “Virtual reality” has been around since the ‘80s, according to most accounts. Essentially, that’s just a marker of when computer scientist Jaron Lanier coined the term. Previous head-mounted devices (HMDs) included the Aspen Movie Map (1978), a simulation of the eponymous Colorado town, and the Sword of Damocles (1965), computer scientist Ivan Sutherland’s 3D binocular display advice, which boasted head-tracking. Sutherland named his device after the Roman orator Cicero’s story about the Ancient Greek courtier Damocles, who when we tried out the tyrant Dionysius’s throne, was warned by an enormous, hanging sword above him of the volatility of power. Our perception of VR has become extremely limited. Does it begin with the View-Master or with the first HMDs? Why does “computer-generated” preface most definitions? If VR is simply an environment or experience simulator, a technology that generates an artificial visual panorama, then there was a whole lot of VR before the tech illuminati began preying on our childhood dreams of emotional transportation (also £500 and your cold, sheeplike soul). I think of my favourite haunt at the Metropolitan Museum of Art in New York City, the bedroom of Fannius Synistor (50 BCE). The 79 A.D. Vesuvius explosion buried the frescoed room until it was unearthed in 1901. The room contains extraordinarily well-preserved perspective painting that depicts a layered city of columns, groves, statues and rotundas. Stepping into the room, which at the Met is expertly reconstructed, it appears that you are looking out the window onto a fantasy town. Imitation marble, painted with shadowy crevices, evokes corridors. Illusionistic is an understatement. Later on in Rome, these transportative painting technologies were used in the service of religion. To me, the most compelling of these is in the Roman Jesuit mother church, Chiesa del Gesù. Its vault, “Triumph of the Most Holy Name of Jesus”, depicts a flurry of golden angels casting heathens down into the church’s body. 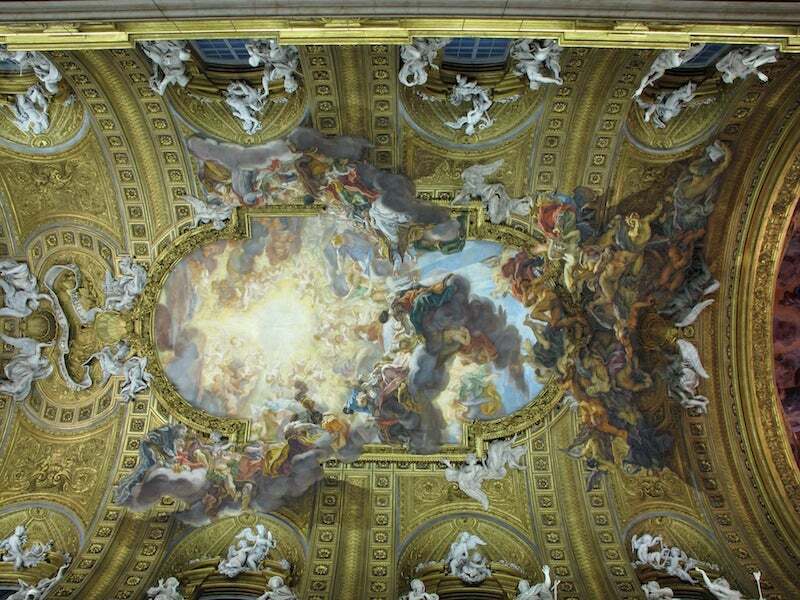 Coloured stucco around the vault’s perimeter depicts cherubs and sinners, literally bursting out of the painting, larger as they come closer to you. Sculptor and architect Giovanni Battista Gaulli, known as Baciccio, constructed the vault of the enormous church with such precision that it appears that heretics are falling along the sides. You are incorporated into the religious moment, standing on Earth where the bodies would slide down. My friends made fun of me for drooling when I saw it. Has VR ever made you drool? The history of VR isn’t about to make room for illusionistic Roman fresco. That’s fine; it doesn’t need to. But, in my opinion, our definition of VR has become constricted, limited, over the last few years. Perhaps this is a branding technique for the Oculus, Vive and other HMDs: taking ownership of the technology’s definition. Nothing is transportative unless it’s rendered with incredible graphical precision, impeccable head-tracking, lifelike perspective. Nothing is transportative unless a computer made it. To me, modern VR is banking on the fiction that using more words to describe something (or more pixels) will make it more vivid. Let’s not forget that technology has always accounted for imagination.